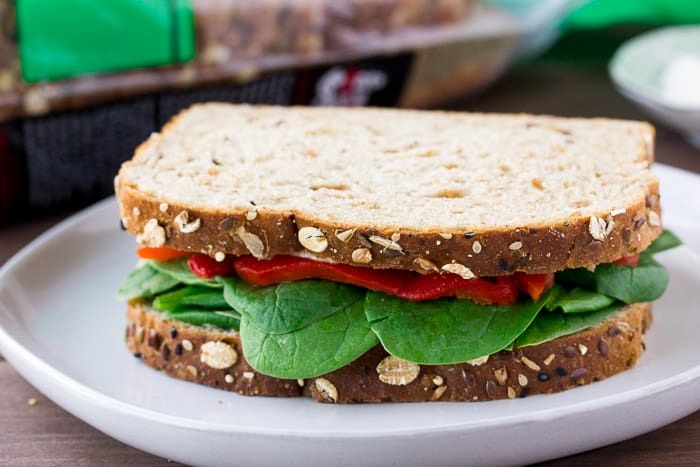 This Roasted Red Pepper Spinach Sandwich is a healthy, delicious vegetarian lunch option! Although I eat meat, vegetarian sandwiches will always be my favorite. 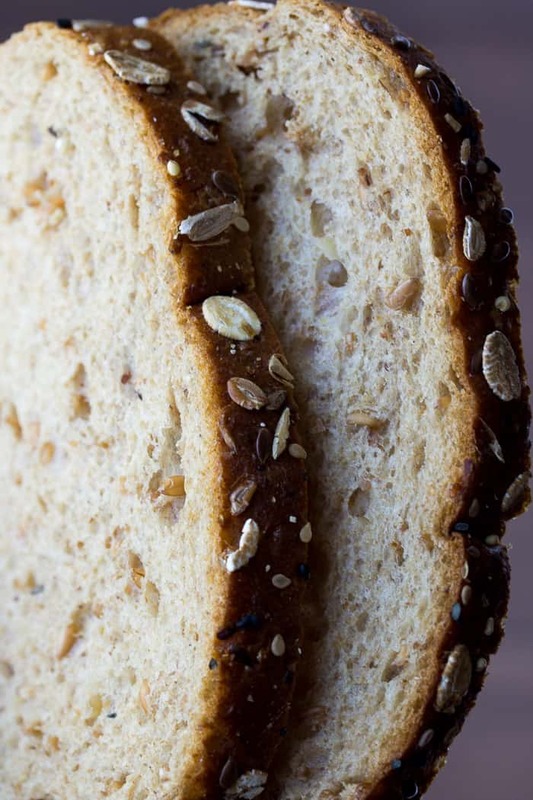 Add a delicious bread with texture from grains and seeds, and it’s the perfect match! This sandwich has a bit of a Mediterranean vibe to it. It’s simple to make and packs well! I had seen Dave’s Killer Bread at my local Walmart store for a few months before I finally decided to try it. Now, I’m kicking myself for waiting so long! It’s so good! I bought Dave’s Killer Bread 21 Whole Grains and Seeds variety. This bread has some pretty amazing qualities to it! It’s packed with protein (5g per slice), USDA organic, and Non-GMO project verified. Each slice also contains 5 grams of fiber, 250 milligrams of Omega-3’s, and 22 grams of whole grains. There is no artificial anything! It’s a hearty bread that holds up beautifully even when it’s loaded with the veggies in this sandwich! I love that you can actually see the seeds on the crust. It has a subtle sweetness to it and is perfect for all types of recipes, or even just by itself! It’s definitely a must-try! 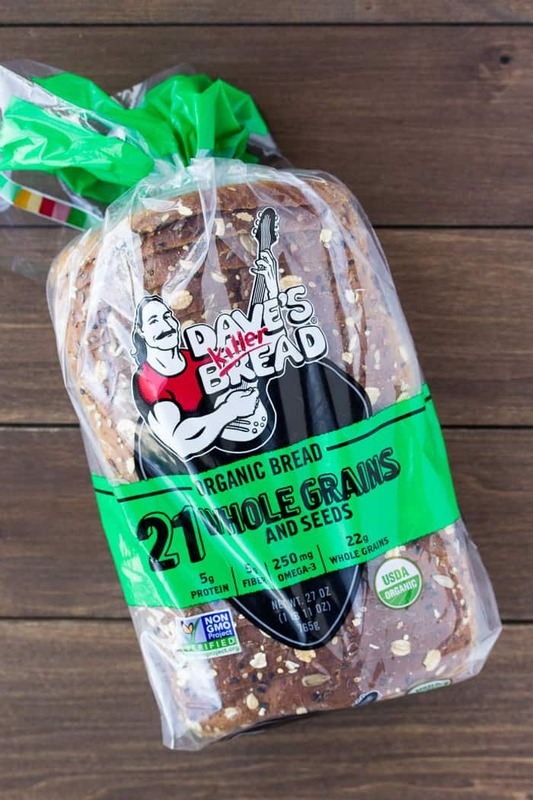 Dave’s Killer Bread is now the #1 selling organic bread in the country! Pick it up at Walmart! If you are roasting your own peppers, you’ll want to do that ahead of time. If you are using jarred roasted red peppers, remove them from the jar and set on a paper towel-lined plate and pat dry some. 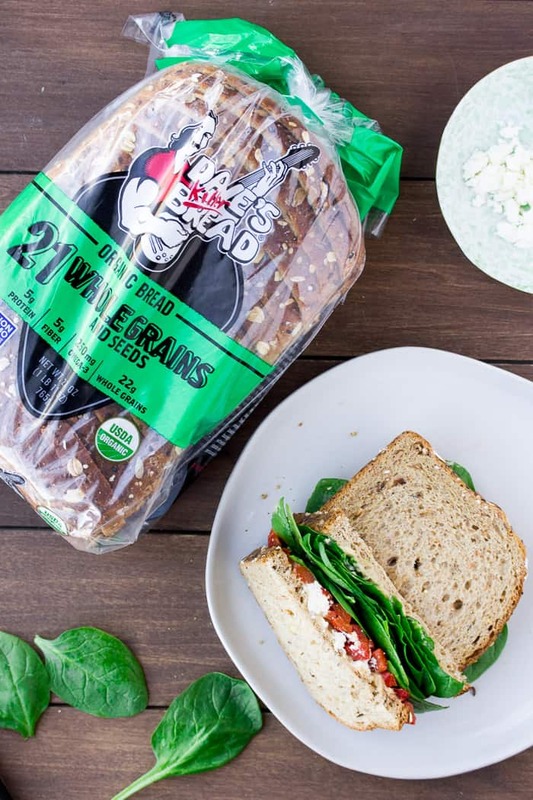 Spread the hummus onto both slices of Dave’s Killer Bread. Sprinkle the feta crumbles onto one side and stack the spinach and roasted red peppers onto the other side. Close the two sides together. 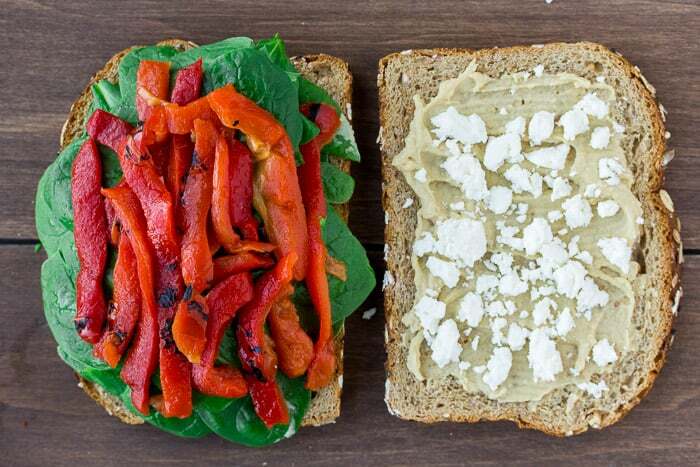 Love this Roasted Red Pepper Spinach Sandwich? Follow us on Pinterest, Instagram, and Facebook for more! 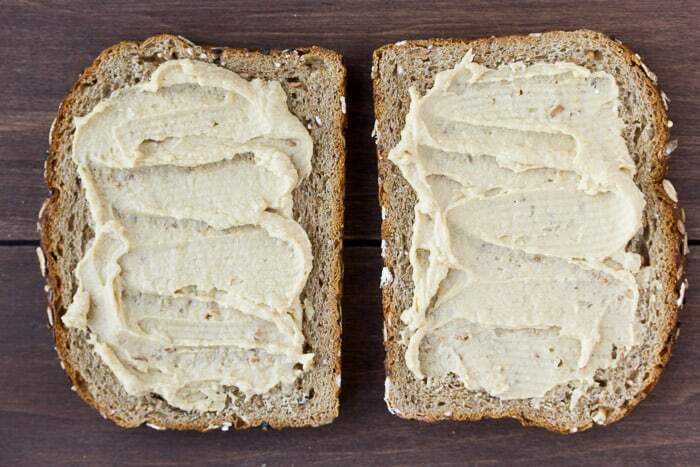 Spread the hummus evenly onto both slices of Dave's Killer Bread. 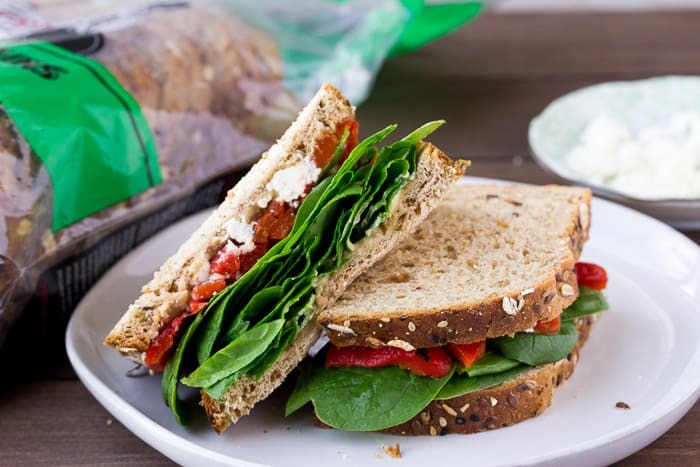 Sprinkle the feta cheese onto one slice of bread and add the spinach and roasted red pepper strips to the other slice. If you are roasting your own peppers, you’ll want to do that ahead of time. If you are using jarred roasted red peppers, remove them from the jar and set on a paper towel-lined plate and pat dry some before using. 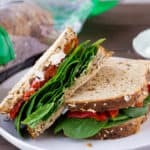 Roasted red peppers are so tasty, so I love that you added them to this sandwich. And the bread looks delicious as well! The best foods are so simple! I love everything about this summer sandwich…and the fact that it’s stuffed between Dave’s Killer Bread. Just pinned…thanks! I love roasted red peppers for a flavorful veggie sandwich. I’ve been seeing this bread in my store, I need to try it. I saw it for awhile before trying too – it’s really good! My husband is a huge fan of Dave’s Killer Bread. This sandwich looks delicious!